It's Christmas Eve. You're supposed to be wrapping presents but you're trolling Pinterest and the blogosphere instead. Don't worry. It happens to the best of us. 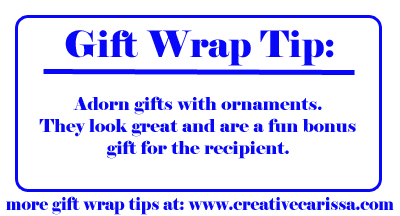 Get something done while you're here and learn how to wrap impressive looking presents with dollar store materials! While these presents look fancy, they are very easy to execute. All of the above supplies were purchased at Dollar Tree and provided enogh supplies to wrap about 15 presents with lots left over. 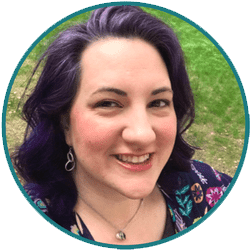 Did you notice that I had a glue gun on the supply list? That's right! All of the accessories on these gifts were adhered with hot glue. 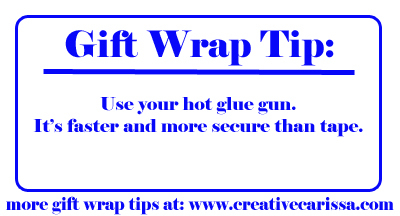 It's faster, easier and more secure than tape. 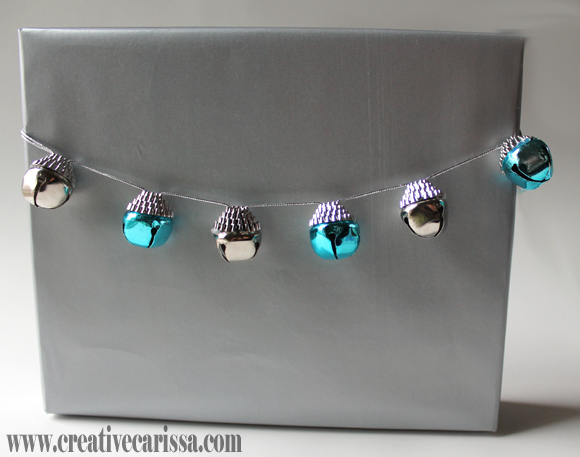 I did use tape to wrap the paper wround the boxes but I do have a friend who uses hot glue for that part, too! Just cut a piece of the garland long enough to string across the front of the package and secure on the ends with hot glue. Twist 4-6 glitter pipe cleaners in complimenting colors together in the middle. Then twist the ends around a pencil to make them round. It looks kind of like a firework, it's dimensional and it's more sturdy than ribbon if you need to travel. 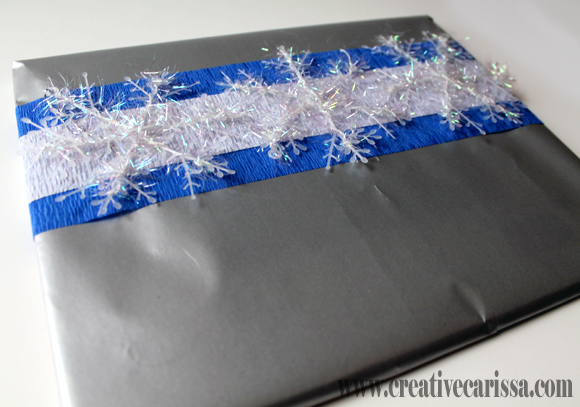 Wrap two pieces of blue crepe paper around your package to make a double-wide strip of blue. 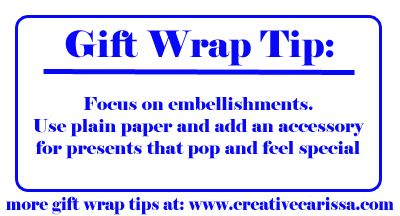 Wrap one piece of white crepe paper around the center over the seam. 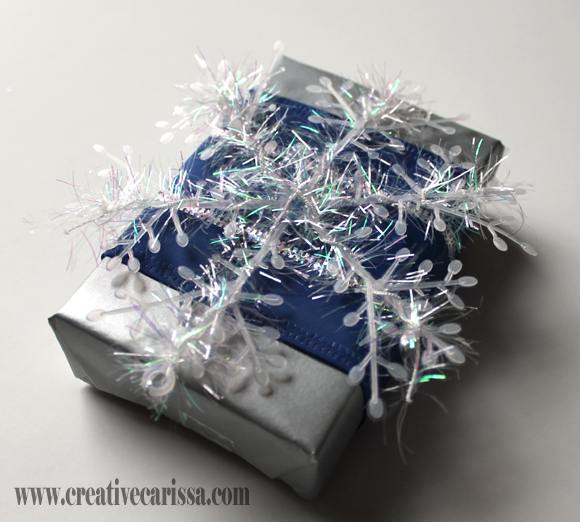 Add three snowflake ornament across the front. 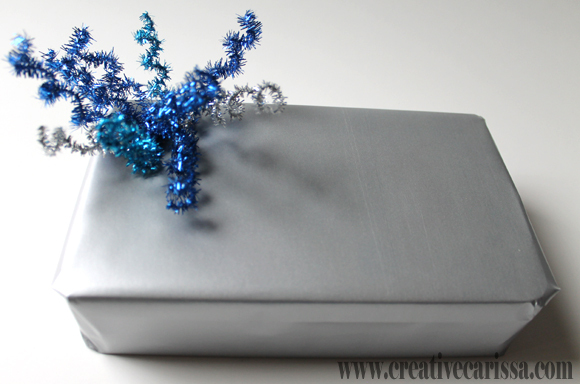 After wrapping your package in silver paper, wrap a doily around the front. 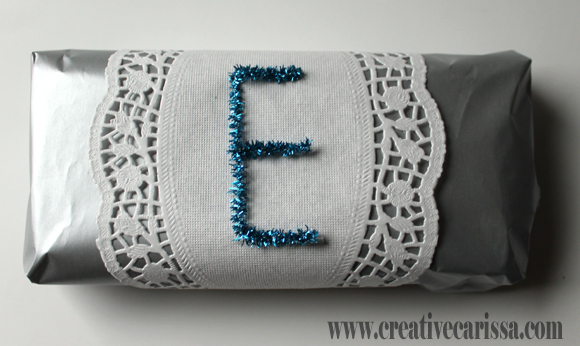 Twist the pipe cleaner into the first initial of your gift recipient and glue to the doily. 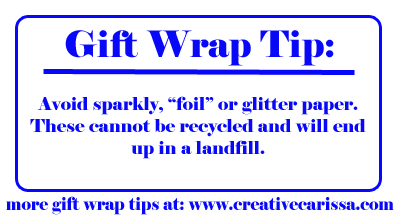 Wrap a scrap of wide ribbon (or use crepe paper) around the width of your box. Add a single snowflake ornament. I love the way you have used a plain paper! I have planned to use either red or just plain brown paper. I also thought about using a stamp & one or two inks on the brown paper. Do you think it will work? I think so, Jane! 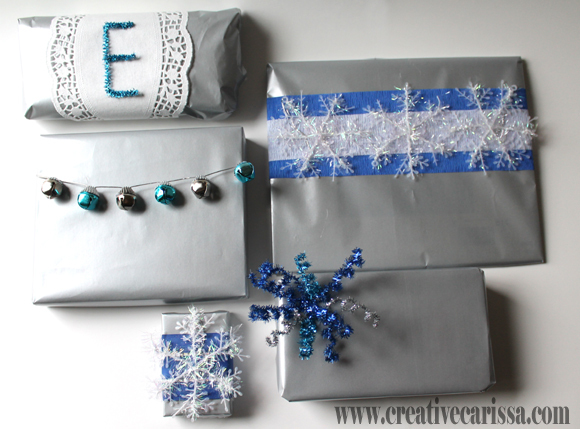 Check out these other plain paper (or bag) makeovers, too!